Chinese companies have managed to perform well in Malaysia, especially after the recession in the mid-1980s, due to a clear change in the Malay dominated government's attitude to Chinese capital. Despite the problems that prevail among UMNO politicians, the government has provided a stable economic environment and offers opportunities for domestic private investment, even for the Chinese. Given these circumstances, it does appear that Chinese capital in Malaysia has reasonable prospects for further growth in the immediate future. This study examines the dominant role of Chinese capital in the economy, providing in-depth empirical research on its mode of development and styles of operation. 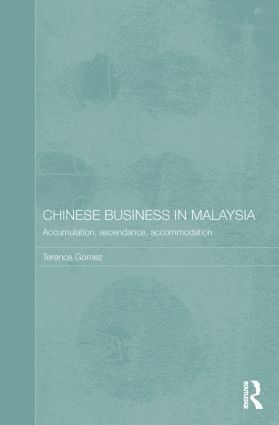 Covering the period from colonial times to the present day this study identifies key issues pertaining to Chinese business operations in Malaysia: ownership and control patterns, style of growth, relations with the state, politicians and other Chinese businessmen, and the manner of development of business abroad, whilst debunking the theory that large-scale Chinese capital is not very entrepreneurial in nature. Edmund Terence Gomez is Associate Professor at the Faculty of Economics and Administration, University of Malaya. He has also held appointments at the University of Leeds (UK), Murdoch University (Australia) and Kobe University (Japan).